A memorial was placed at the corner of Powerhouse Boulevard and Hardan Road. 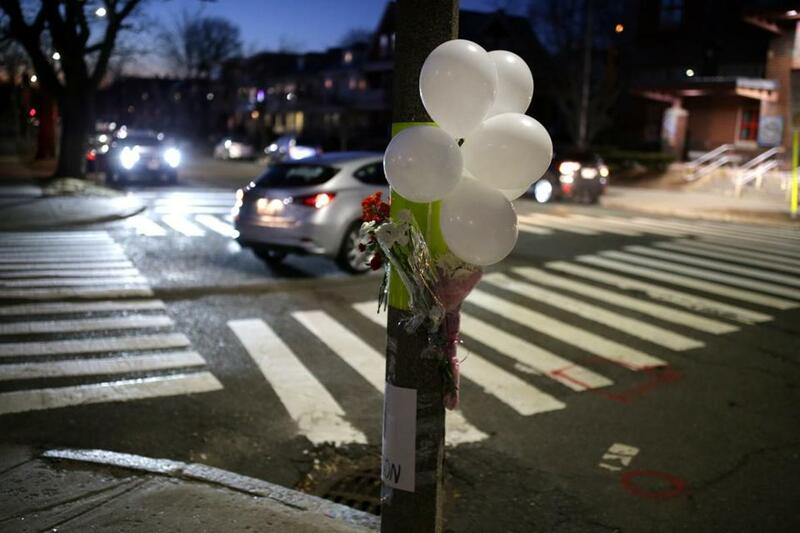 SOMERVILLE — A memorial of flowers, candles, white balloons, and a sign that said “gone too soon” was assembled Saturday at Powder House Boulevard and Hardan Road, where authorities say a Somerville woman was struck Friday night in a fatal hit and run that injured a second woman. The woman killed was identified by the Middlesex district attorney’s office Saturday as 40-year-old Allison Donovan. Donovan was a K-8 literacy coordinator and Title I coordinator for Watertown Public Schools, where she had long been a teacher and administrator, Deanne Galdston, the district’s superintendent, said in a statement Saturday. After the hit and run, Donovan was taken to Mount Auburn Hospital, where she was pronounced dead. The woman injured in the crash, whom authorities have not named, was taken to Mount Auburn and later discharged, the district attorney’s office said. Somerville police were trying to locate the truck that allegedly struck the women, described as a “newer model, full-size, black pick-up truck with front-end driver’s-side damage” and a black cover over the bed, according to the statement. The vehicle may be a Ford F-150. Police are asking for help identifying the driver, who fled the scene, the district attorney’s office said. On Saturday, no one answered the door at Donovan’s home, a multifamily house just down the road from the intersection where she was struck. Up the street, Peter Goldman and his wife, also named Allison, said Donovan was well known in the neighborhood and in local restaurants, someone who had already made Powder House Boulevard her home when the Goldmans moved in nearby a decade ago and befriended Donovan. Speaking to a reporter as they walked back down the block from leaving flowers at the memorial to Donovan, the Goldmans said Donovan was a crafty, thoughtful educator, and a dog owner, like them, who brought gifts for both their baby and their dog at a baby shower last spring. “She was such a wonderful person and will be so missed,” said Allison Goldman, a tear rolling down her cheek as she held her 7-month-old son, in a pouch on her chest. “She was so loved,” Allison Goldman said. Susan Tichanuk, 64, said she has lived near the intersection where Donovan was hit for about 20 years. “Cars go so fast; it’s like a highway here,” she said. Tichanuk said she mostly avoids walking there at night because it is difficult to judge the distances. “It’s so terrible that it happened,” she said of the hit and run. “Her legacy will live on in so many of us who have benefited from her collaborative leadership and rich expertise,” she said. Lucas Phillips can be reached at lucas.phillips@globe.com. Jeremy C. Fox can be reached at jeremy.fox@globe.com.